Looking for a new place to hunt coyotes, bobcats, foxes and varmints with little pressure? 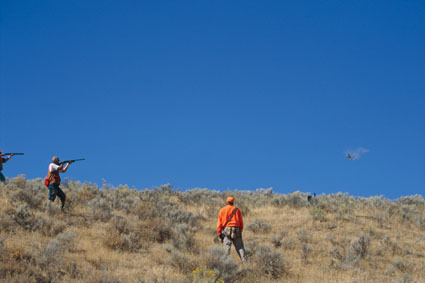 Try bird hunting preserves, where eager predators abound! Our second day of shooting had just begun. Shotguns in hand, we headed across a grassy flat, dogs eager. I dropped a single bobwhite near a hardwood stand, and a pile of feathers off to the side caught my eye. "Coyotes," said the handler. "They're all over. This was likely a bird left over from yesterday. 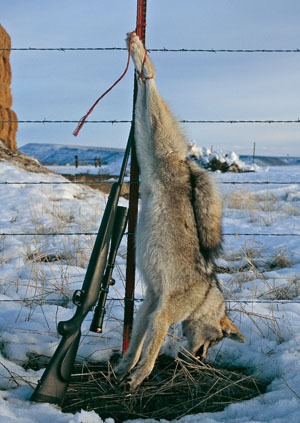 Those darn coyotes are a big problem; they cost us a lot of money every year." I'm not the quickest guy around, but when I heard the words "coyotes" and "problem" lumped into the same sentence, a green light went on. "So can a guy come hunt coyotes here?" I asked. "You bet, and foxes and bobcats, too," he replied. Just like that, I had a new place to hunt predators. As our quail hunt advanced into midday, I couldn't stop looking for predator sign. Once I turned my attention from birds to predators, I was amazed at the amount of sign—piles of bird feathers everywhere. Trails meandering through patches of brush left no question as to what made them. Fresh tracks of coyotes and foxes in the muddy road revealed what was hunting at night on this preserve. Bobcat scrapes were also evident, as their breeding season was in full swing. By day's end, I'd made a mental log of all the places I would have set up for predators; what blinds I'd use, where the decoys would go, and more. This was a predator hunter's dream. When you think about it, bird preserves are the perfect place to hunt predators. In such settings predators have become conditioned to hunting an easy food source. As birds are released, sometimes daily, for several months during the year, the food supply is relatively constant. And it’s not just cripples. Even healthy birds within many preserves are weak fliers when compared to wild birds. So preserve birds missed by hunters often fly only short distances, keeping a high retention of bird numbers within a relatively small area. Likewise, pen-raised birds often hold tighter than wild birds, meaning approaching predators might be able to pounce on them before they even take flight. With so many birds holding tight, and covering more ground on foot than on the wing, preserves are heaven for predators. Once predators get a whiff, and taste, of what it's like hunting on a preserve, you’ll never run them off. For bird preserves that have been around for decades, several generations of predators might have been raised on them. They’re used to humans and human scent. Not that a predator hunter should give up the wind when hunting preserves, but the animals he’s after are accustomed to human scent and activity. In fact, some predators simply don't care. On one pheasant preserve near where we hunt deer in South Dakota, the owner had a badger break into one of the holding pens. The aggressive varmint dug under the pen and accounted for the death of hundreds of birds, mostly due to injuries incurred from flying into the nets in panic. The owner was forced to shut down for several months, and he lost a great deal of revenue because of a single predator. He could have used help. Predators are such a large problem on some preserves that professional shooters are called in to hunt them from airplanes or helicopters. Recently, while at a sport show in the West, I asked the owner of a bird preserve about the possibility of my coming out to do some coyote hunting. "Just last weekend I had to hire a plane to come in and shoot," he told me. "They took 29 coyotes off the place, so now might not be a good time for you. Give me a call later in the spring, as the coyotes will be back in there, thick." The best time to hunt preserves is during off-days, when no bird hunters are in the field. However, some preserves operate, every day that it's legal to hunt. So the next best time to hunt predators is usually in the evenings, when bird hunters have left the field, and coyotes and such start moving around to scrape up lost and escaped birds. Hunting within preserves enables hunters to take a different approach than they would when pursuing predators in less food-laden surroundings. For instance, in some states, electronic feeders can be used to keep escaped birds in the area to hunt or recapture. Often the automated feeder is set to kick on prior to dusk. Birds that have escaped hunters, especially bobwhite quail, start calling, and gathering at the feeder then. Not only is the sound of an electric feeder going off a dinner bell for missed birds, it rings in predators as well. In fact, I've talked to some hunters who don't even call in such situations. They simply set up, within range of the feeder, wait for it to kick on, and pick off predators as they come in to feast on birds. Due to the open, sometimes flat terrain in which many bird preserves are situated, hunting predators from ground blinds can be an excellent option. In addition to offering 360 degrees of concealment, there's also 360 degrees of visibility. This can be a big advantage when hunting predators who aren't as wind-cautious and are used to being around human scent, because they might approach from any angle. For the same reason, tree stands can be very effective. Tree stands are perfect to hunt the edges of woodlots surrounded by tall grass, as well as near feeders where it can be tough to find concealment except in a tree where leaves and branches provide cover. Decoys are valuable hunting tools. They can draw predators into close range for a shot. Aggressive preserve animals often react to the most subtle of decoys. Last winter, I hid at the edge of a field, hoping to call a coyote. The preserve I hunted was fairly new, less than three months old, but the coyotes had already staked it out as a food source. I tied the broken wing of a pheasant to a string, then hung it from a branch. Then came a few bird-in-distress sounds, and a coyote soon appeared at the edge of an oak thicket. Within minutes another yapper popped up, then another. All three were interested, and began to slowly move toward the sound. When they caught a glimpse of the moving wing flapping in the breeze, the race was on. Unfortunately, the young man who accompanied me grew a bit anxious and moved. The coyotes spotted him and scampered off. Preserve coyotes might be less wary than their pressured brethren elsewhere, but at some point natural caution kicks in. Bird distress calls are very effective when calling on preserves. No surprises there. They'll work on both coyotes and foxes, and if you're out West where badgers can be hunted, bird sounds work wonders on those aggressive members of the weasel family. While bird calls work well, don't forget jackrabbit or cottontail distress sounds. Bunnies inhabit shooting preserves across the country, and are part of the prey base. As for weapon selection, there are no limits unless the owner tells you differently. However, one setup might be more limiting than the next, so be prepared for any range. One preserve I hunted consisted of small open fields surrounded by thick stands of timber. And though the surrounding properties were well out of shotgun range, it was not a good place in which to fire a rifle. For this hunt, a shotgun was the necessary choice. On another preserve I hunted, hunting stopped at a set time late in the afternoon out of courtesy to the neighbors. That meant bows and crossbows were the best choice for evening predator hunts. If you’re looking for a new place to hunt predators, give bird preserves a try. Make your contacts well ahead of when you want to hunt, so you know what you're getting into. It’s frustrating to knock on a door, seeking permission to hunt, only to learn an airplane has just flown the area, or another hunter beat you to it. By doing your homework, a new door to great hunts can open. Bird preserves are big business across the nation, and every bird that's lost to a predator costs the preserve owner money. Do the research, make the phone calls, and you might secure some great predator hunting opportunities, right in your backyard.